Caution: This desert survival kit is not intended for a zombie apocalypse or to help you hide from the government in the wilderness. This survival kit is only intended to help keep you alive in a desert wilderness while trying to become un-lost. As with any survival advice you find anywhere, be it on the internet or otherwise, do your own research, seek expert advice, and tailor it to fit your specific needs and situation. The items below are only what I personally carry in my pocket survival kit and may not be the best fit for you in a particular situation. Soap Dish – I prefer the plastic travel soap dishes with the top that slides over the bottom. They’re fairly airtight and can hold a bit more supplies than something small like an Altoids can. Just be sure you don’t get one that has the drain holes in the bottom. Your soap dish can be used as a cup in a pinch, but don’t try boiling water in it since it could potentially leach toxic chemicals into your water. Duct Tape – Wrap a 3′ (or longer) piece around your soap dish once you have it packed with everything you’re gong to put in it. You can use the tape to patch holes in containers and clothes and to mark trails, along with hundreds of other uses. I used regular silver duct tape on my kit, but day-glo orange is much better. Remember, you want to get found, not hide from the zombies. The bright, contrasting color will stick out to anybody looking for you. When wrapping your kit, try not to crinkle up the tape too much. It could make it harder to use in the event you need it. Also, when you need to take it off to get into your kit, try to save as much as possible. You can wrap it around your trekking pole to make it easy to get to and to save as much as possible. Knife – A knife is one of the most important tools you can carry. You should always carry a good quality knife on you beyond your survival kit, so carrying a back-up in your pocket survival kit is a must. I carry a Boker Subcom F Folding Pocket Knife because I like the combination serrated and regular blade and it’s easy to put a good edge on it. If you want to make it a little thinner to fit in your kit better, you can take the belt clip off of it with a small star wrench. Note: I’m not suggesting that the Boker Subcom F is the premiere small folding knife and it’s the only thing you should consider putting in your desert survival kit, it’s just what I like. If you find something better and it fits into your kit, awesome, put it in there. There are thousands of high quality knives on the market. Choose the best one for you. Pencil and Paper – It’s helpful to be able to take notes while traveling. Additionally, if you are leaving a vehicle, bicycle, or other transportation behind (although, in most cases, it’s not the best option to leave your vehicle) to make your way back to civilization, you can use it to leave a note for search and rescue in case they arrive at your vehicle before finding you. I didn’t add pencil and paper into my personal kit due to it not fitting, but it’s something you should consider. Plastic Bag – Reynolds Turkey Sized Oven Bags are nice and compact and durable at the same time. They can be useful for holding water or water proofing your supplies. Heavy Duty Aluminum Foil – Signaling, use as a cup and for boiling, etc.. A 20″ x 20″ piece folded to fit neatly in your kit. Make sure it’s heavy duty though, regular foil tears too easily under much use. X-Acto Knife Blades – For fine work as well as a backup for your pocket knife. LED Flashlight – A small keychain LED Flashlight (with the chain removed) will easily fit into your desert survival kit. Water is one of the most important things you’ll need in the desert, and at the same time is one of the most difficult to obtain. You need at least a gallon of water per person per day, and as much as four gallons per person per day if you’re hiking in the hottest parts of the day in the heat of the summer. 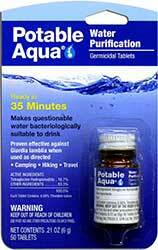 Water Purification Tablets – You should be certain that any water purification technique you use is effective against Giardia. Keep in mind when using chemical treatments like these tablets, or filters and boiling, that they do little to nothing to remove chemical pollutants. With that in mind, it’s best to get water from sources with algae and plenty of insect life. If it doesn’t look like it’s full of life, it could be chemically tainted, move on. I put my tablets in a small zipper bag to save space. You should understand that if you do this, it will reduce the shelf life from about four years to about nine months. I just replace them whenever I replace the first to go out of date of my medication. Lighters – A couple of the small Bic lighters work great. I stick to the Bic Brand because they seem to be the most reliable. I accidentally left one next to my BBQ pit for a couple of months in the rain and sun and it still worked when I picked it up again. Just remember, if you put a lighter in your desert survival kit, you’re going to want to keep it out of the sun. If it gets too hot, it could explode. Also, when you put them in your kit, make sure the butane button isn’t pressed or you could end up with empty lighters when you need them. I recommend lighters instead of matches because you can get about 300 lights per lighter as opposed to one per match. If you want to put some matches in your kit for back-up, feel free. Just be sure you use the strike anywhere kind. 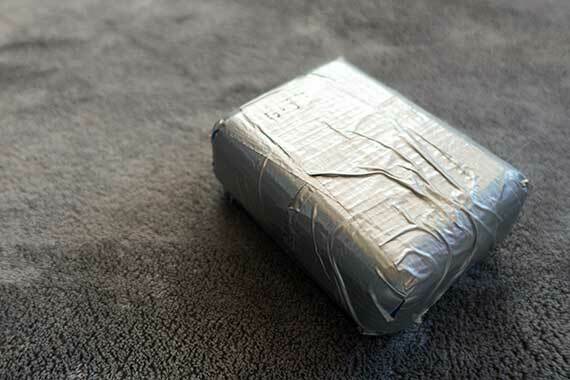 Cotton Balls – Fill in all the loose space in your survival kit with cotton balls to keep things from rattling around. They make great tinder, especially when combined with a chapstick. I didn’t put any into my kit because everything is so tightly packed, but add them if you can. Chapstick – Chapstick is useful to keep your lips from getting dry and cracking, but since most brands are also petroleum based, it can also be helpful in getting a fire started. Just put a little on your Tinder Quick or on some of the cotton balls in your kit before lighting them. Magnifying Strip – Nice and compact and easy to get a fire started with on a clear day in the desert. I like the pocket sized fresnel lenses linked because they come in plastic sleeves which will keep them from getting scuffed and scratched until you’re ready to use them. Tinder Quick – Easy to use tinder for getting your fire started. Each piece should be shredded and fluffed to make a rats nest to catch a spark. You should also make sure you are proficient at building a campfire the right way. Tinder isn’t very helpful if you don’t know how to effectively build a fire without a lot of accelerants. Food is the least important priority in a desert survival situation. I honestly hesitated to include anything for the acquisition of food in my desert survival kit, but the bronze wire below can also be helpful for a number of other things, so I went ahead and added it. Just remember, if you are light on water, you should not eat anything. Digestion forces your body to consume additional water. You could end up accelerating dehydration. Snare Wire – 10′ spool of 24 gauge bronze wire. Great for snares, but useless if you don’t know how to make and set a snare. As always, make sure you’ve learned and practiced any techniques that you plan to use to save your life (please don’t kill an animal unless you’re going to skin it, gut it and eat it yourself). Also, don’t abandon snares in the wilderness. Take them all back up before you leave an area. Button Compass – You should already be carrying a map and compass, but things can happen. Your regular compass can get broken or lost. Keeping a little button compass in your kit is a good back-up. I put two in my kit just in case. Cheap button compasses can be somewhat unreliable. A backup can be useful to double check. 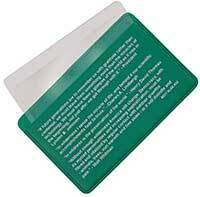 Remember when using it, keep it away from metals, they can distort the reading. Signal Mirror – The most important thing you should be doing in a desert survival situation is trying to get found. And, since this kit isn’t designed for setting up a wilderness homestead while hiding from federal agents, a signal mirror is a good addition to help rescuers in their efforts to find you. You should spend some time learning how to use a signal mirror properly though prior to relying on it to save your life. Getting a specially designed signal mirror, instead of just a plain old reflective surface, will help make your efforts to be seen more efficient and effective. Whistle – Although a safety whistle can’t reach out to the distances that a signaling mirror can, you don’t need line of sight. It can also be helpful in scaring off wildlife. Of the small safety whistles that I’ve looked at, I prefer the Acme Slimline because it has a less natural sound (unlike the Jetscream) and still easily fits into my kit. It’s also ridiculously loud. I thought my wife was going to stab me when I blew mine in the house while she was working on her computer. You can check out a video of a comparison of three of the more popular safety whistles here . In addition to my recommendation below, you should be certain that you are carrying enough of any prescription medication that you need to go at least an additional three days more than planned, just in case. Tweezers – An absolutely essential tool for removing cactus thorns and glochids. No desert survival kit is complete without tweezers. Survival Blanket – During the day, it can be used as a temporary shelter, reflecting some of the harsh rays from the sun, and help keep you warm at night by reflecting some of your body heat inward. Rain Poncho – Protection from the rain may not seem that important, but rain does happen in the desert, especially in the summer. It can also double as a transpiration bag (if it’s clear enough for sunlight to get through) and water proofing for supplies. I don’t keep a rain poncho in my kit due to a lack of space, but it’s something you should consider when assembling yours. I always carry one in my backpack though. Keep it in your pocket, not your backpack. If you lose your backpack and your desert survival kit is in it, you’ve lost everything. It’s best to stick it in one of your pockets, especially if it has a flap and button to keep things from falling out. I generally wear cargo pants or shorts, the side pockets are perfect for holding my survival kit. A note on clothing colors. Unless you have ninjas chasing after you, don’t wear camouflage. Try to wear clothes that contrast with the environment. Bright colors and solids are best. Your job is to make the job of rescuers easier, not hide from them. How to signal for help. Whether you’re using a signal mirror or whistle to signal to rescuers, you want to make sure it sounds or looks artificial, and not like it is part of nature. The general rule is to signal in bursts of three, so three loud whistles, or flashes, then a pause, then three more. Keep things fresh. Each item that you put in your kit that has an expiration date needs to be kept fresh. For items that you take out of its original packaging, be sure to label its new container not only with what it is, but also its expiration date. After you have everything packed up and your soap dish taped together, write the earliest freshness date on the duct tape with a Sharpie Marker. That way you’ll know when to take it apart and replace the necessary contents. Don’t forget to write the new date on the outside when you put it back together. 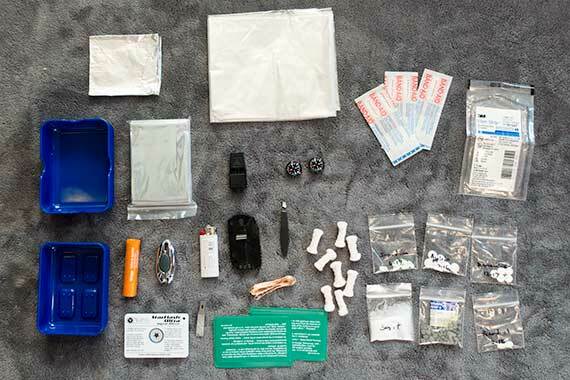 No fishing gear in a pocket desert survival kit. A lot of people recommend putting fishing gear, like hooks, line, and sinkers in their pocket survival kits. I believe that food is very low priority in most survival situations. In most survival situations, and especially in the desert, you shouldn’t even consider eating. Eating causes your body to use more water for digestion. It could actually accelerate dehydration. If necessary, you can go for a couple of weeks without food. A day without water in the desert can kill you, sometimes, depending on the temperature, it can kill you in hours. Spend your time resting, looking for water or working to help rescuers find you rather than chasing rabbits or fish. * A note on medical supplies and recommendations: I’m not a doctor or medical professional, as with any medical issue or recommendation, you should seek the advice of a medical professional, especially as to any specific conditions you may have. In this list, I’ve recommended that you carry a variety of different pills. Since your pocket survival kit isn’t going to have the capacity to carry the entire package of each kind of pill, I recommend putting them in individual ziploc bags (the tiny ones) and adding a slip of paper with exactly what they are, directions for taking them, and their expiration date. One final note: Having a desert survival kit in your pocket is not a license to take stupid risks. The most important and effective survival tool that you have is your brain. You should thoroughly research the topic and your region before sticking your neck out. Your life is your responsibility, and yours alone. Do you carry something in your pocket survival kit that I didn’t list above? Let me know in the comments below. I might want to add it to mine.